I signed my settlement release for my car accident case. How long will it take to receive my check? Will an attorney take my car accident case? My doctor won’t release my medical records to me because my treatment was related to a car accident. What should I do? If you were involved in a car accident and your doctor will not release your medical records because your medical treatment was related to injuries you suffered in a car accident, don’t worry, your medical provider should eventually provide them to you. 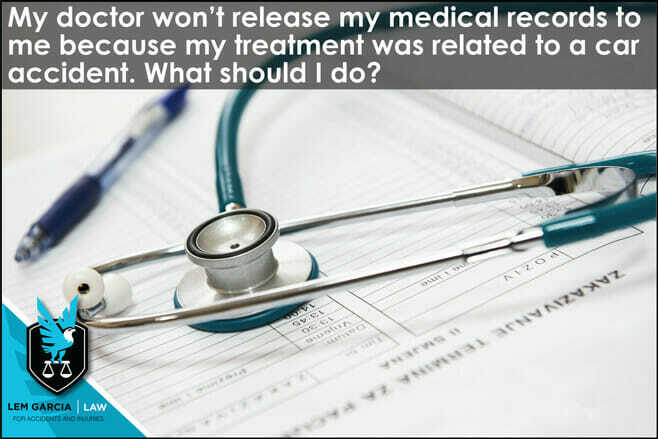 There are many potential reasons why your doctor will not release your medical records to you. One of the most popular reasons is because your doctor is not interested in becoming involved with a lawsuit. Your doctor may be busy treating a lot of patients and does not have the time and/or interest to invest time in your lawsuit whatsoever. If you were injured in a crash and sue the party who injured you, your doctor may be required to have his deposition taken or even be a witness at trial. By refusing to provide you with medical records, your doctor believes that he or she will be able to avoid involvement in a lawsuit, which is also a reason why some primary care physicians refuse to provide medical treatment to people who have been injured in a car accident. In most situations, if you and/or your attorney inform your doctor that their failure to provide medical records and bills is a HIPAA violation, they will provide you with your medical records and bills within 30 days. It is clearly a HIPAA violation for a medical provider to refuse to release medical records and bills to its patients. Your medical provider must provide you with your medical records and bills for your review and inspection within 30 days – on demand. West Covina car accident attorney, Lem Garcia, helps make sure that you are taken care of after a car accident. We help make sure that you maximize your recover and minimize your stress. Call us today for your free, no obligation, consultation. We will be happy to help you.